1 What does a Labradoodle cost? What does a Labradoodle cost? A Labradoodle can cost from $500 to $2,500 depending on how reputable the breeder from whom you’re purchasing it is. A highly reputable, well-known breeder will be in the higher range of about $2,000 while a ‘backyard’ breeder may only charge $500. It’s important to purchase your puppy from a reputable breeder. Well-known breeders that have been around for many years who stick to excellent breeding standards will charge upwards of $2,000 as they spend much more time raising the puppy, may need to pay to have the female inseminated if natural breeding is not possible, may have to pay a stud fee if they want to use a dog from another breeder, to provide a clean and safe kennel for the puppies and parents and to provide lifetime support to the buyer – you can see how these costs can quickly add up, hence the reason that they charge much more. Breeders that are charging you $500 for a puppy are most probably not spending a lot on overhead as mentioned above. 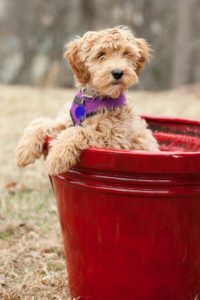 In addition, they may not let you meet the parents of the puppy, they may not let you visit the kennel at which the puppy is growing up and they may be a fairly new breeder. While $500 sounds like a great deal and may be cheaper in the beginning, it can cost a lot more in the long run both financially and emotionally. It is important to purchase your Labradoodle puppy from a reputable breeder. All healthy dogs love to eat. You want to feed your dog enough to keep her energetic and nourished. At the same time, you want to avoid overfeeding. Healthy eating habits start at a young age. You also want to be especially careful of your Labradoodle’s weight throughout his life. Labradoodles are prone to hip problems. Hip dysplasia is a relatively common ailment found in these dogs. The more overweight your dog is, the more his hips, joints and musculoskeletal system will be strained. You’ll need to determine the number of calories your dog will need to eat each day. This is usually described in terms of per pounds of the dog’s body weight. Don’t worry – you don’t have to just figure this out. There are charts available online. Of course, the best way is to work with both your veterinarian and your dog’s breeder. They’ll help you determine the proper amount. To help ballpark the numbers: a 7-week-old puppy weighing five pounds needs 400 calories per day. The number of calories in a pound of puppy food is divided by the number of calories your dog needs each day. This will give you a starting portion amount. If the puppy is between four and 12 months old, you’ll feed them three times a day. There’s a common misconception that puppies need to be fed between six and eight times a day. While more frequent feedings do improve the puppy’s ability to extract nutrients from the food, the effect is only very slight. It’s really not worth the extra effort of meal preparation and clean-up. Three times a day is perfectly fine. If your puppy eats his entire meal – every bit – for three days in a row, then add five percent more food to each meal thereafter. If your puppy still eats everything after another three days, then add an additional five percent to each meal. You’ll repeat this process until eventually your puppy is leaving a little bit of food behind at each meal. Note that your young Labradoodle might never reach a point where he’s leaving food behind. That’s okay. You (and your vet) just need to make sure your puppy is gaining a consistent amount of weight each week. Around 10 to 12 months your puppy will likely slow down at meals. Once your pet gets to be one year old, you’ll switch to twice daily feelings. Feed one-third of the total calories in the morning and the remaining two-thirds in the evening. This should then be their eating schedule for their entire lives. If your dog doesn’t have enough toys, he’ll let you know. He’ll chew on the sofa, shoes and whatever else seems appealing. In order to keep your stuff safe, and keep your dog happy, you’ll need a regular supply of toys. The exact type of toys depends on you and your dog’s preferences. Some dogs love to play catch with tennis balls. Others love to chew on stuffed toys. When buying throwable toys, avoid anything made of very hard material. One stray bounce in front of your pet can accidentally knock out a tooth! This is actually one of the most common ways dogs lose teeth. When buying chewable toys, be aware of any small parts. Few instance, quite a few dogs toys have small squeakers inside. If the dog is strong enough to tear open the toy, he can accidentally swallow the squeaker. Most Labradoodles are easily able to tear apart most toys, so this can be a real concern. As you’ve probably guessed, Labradoodles can go through toys pretty quickly. You’ll want to ensure your furry friend always has plenty of toys to play with. Labradoodles with straight coats are said to have “hair” coats. Labradoodles with wavy coats are said to have “fleece” coats. Labradoodles with curly coats are said to have “wool” coats. No matter what type of coat your Labradoodle has, you’ll need to schedule regular appointments at the groomer. A Labradoodle should be groomed at least once every two to three months. You’ll want a haircut, nail trim and a bath. A trusted veterinarian is a valuable partner in keeping your dog healthy. You’ll want to find a certified professional who is reasonably close to where you live. After all, if the vet is a far drive, you might be discouraged from keeping your appointments. If you’ve never owned a dog before, finding a vet can seem a little daunting. You’ll want to check out online reviews. Also, most vets are fine with you stopping by to meet them and look around the office. A reputable breeder can also help you find a vet. Most breeders will have a working relationship with some veterinarians in their area. The average Labradoodle weighs between 50 and 65 pounds. They’re also very energetic, athletic dogs. This isn’t always a positive. Left improperly trained, your Labradoodle can be quite rambunctious. An untrained Labradoodle might chew on furniture, bark incessantly and generally tear through your home. A properly trained Labradoodle is a completely different story. Training helps your dog learn to behave both inside the house and outside in unfamiliar situations. The key to successful training is to start early. Find a professional trainer near you. This will be a classroom with other human and dog students. You can learn the proper techniques while also help your dog become used to crowds, other people and other dogs. While the Internet is a great resource here, don’t forget to ask your vet and your breeder if they have any personal recommendations. Labradoodles are more of a time commitment than many people realize. They’ll need to be exercised twice a day for at least 20 minutes each time. They’re generally energetic, playful dogs. While that can be wonderful and fun, know what you’re getting into. This isn’t a good pet for you if you’re away from home a lot or prefer not to occasionally take the dog out for a walk in the rain. The more prepared you are, the happier life will be with your new Labradoodle. A proper diet and health care will keep your new furry friend active well into his senior years. Proper exercise and toys will keep him happy (and keep your shoes safe). A home designed with a Labradoodle in mind can be a very happy home indeed.